Lansdale Township, Montgomery County replaced its streetlights with LED lights in a collective purchasing program through the Delaware Valley Regional Planning Commission. 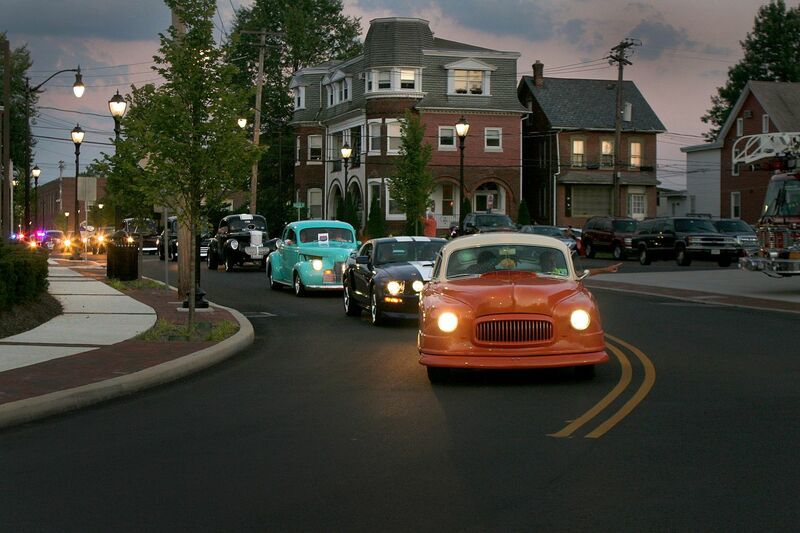 The new lights shone at this month's classic car parade. Lansdale Borough officials had talked for years about replacing all the borough's outdoor lights with more energy-efficient LEDs. One thing was stopping them: money. "It's just that it's quite an investment to try to pay for," said Andy Krauss, electric superintendent of the Montgomery County town. So Lansdale's practice over the last several years was to wait for streetlights to malfunction and replace them one by one with LED lights, which meant uneven lighting. But in a few months, the streetlights, traffic lights, lighting in parks and parking lots, and other exterior light fixtures the borough owns will all be LED, thanks to an unusual partnership with neighboring towns that could serve as a national model for municipalities, according to the National League of Cities. Lansdale is one of 35 municipalities in Southeastern Pennsylvania that came together to use collective purchasing power to convert their outdoor lighting to LED. Thanks to that economy of scale, they all paid less than they would have had they acted alone. LED bulbs use less than half the energy and last far longer, so using them reduces operating and maintenance costs. Plus, they are more environmentally friendly. Officials said they also improve the quality of lighting for residents and visitors. Roughly 95 percent of the more than 25,000 planned LED light fixtures have been installed. Local governments typically spend roughly two-thirds of their energy budgets on lighting, according to the Delaware Valley Regional Planning Commission, which pitched the collaboration idea to municipalities in 2015. Many don't have the technical capacity or the money to complete such a project on their own. The municipalities will save a total of $1.4 million annually in energy and operating costs through the planning commission's program. After the savings pay for the project costs — which would take a decade, on average — the communities stand to save a total of $15 million over the next 20 years, according to the commission. "This project is, to me, local government at its best," Krauss said. "A bunch of local communities coming together to make a difference (for) the economics of it and the environment." Such a collaboration among towns to invest in sustainable infrastructure is a rarity, even as an increasing number of cities switch to LED lighting, said Cooper Martin, program director of the National League of Cities' Sustainable Cities Institute. "The model they're going with is something we've been interested in for a while," Martin said, adding that other municipal groups across the country could learn from the DVRPC's program. "Generally, it's a really, really great way for municipalities to save energy, reduce their own utility costs, and just sort of redo aging infrastructure." The commission learned from similar efforts by the Metropolitan Area Planning Council in Boston and the Mid-America Regional Council in the Kansas City area, said Liz Compitello, senior research analyst at the commission. During the Regional Streetlight Procurement Program's first round, officials in 45 municipalities expressed interest in joining. Of the ones that dropped out, a handful planned to slowly phase in LEDs instead of installing them all at once. Municipalities have to consider the age of current lights and whether replacing them prematurely makes sense. Local governments in the region have an advantage over others across the country, because if they do not already own their light fixtures, they can buy them from Peco, something not all utilities in other areas allow. The second round of the project just got underway, and the commission is accepting letters of interest until Aug. 15. Officials in about 30 other towns have said they want to join. The commission did the legwork to bring the municipalities together, set up the program's structure, send out requests for proposals, find consultants, and offer financing. Conversion project costs $24,000 to $2.2 million, depending on the number and type of lights. The total cost was just over $13 million. Phoenixville started replacing its lights in September and finished installing its last four LED traffic signals a few weeks ago. The bulbs in the streetlights the borough used before needed to be changed about every five years and the fixtures required maintenance so often that the borough hired a contractor to handle it, said Jean Krack, borough manager. But the new LED fixtures, which cost the borough $400,000, will last 20 years, on average. "The maintenance has just come down dramatically. And that's a cost savings," Krack said. "I think most people have been very happy with the way [the borough] is lit and how it's lit." Officials in Lansdale, which has a budget of about $15 million, borrowed from capital funds and paid roughly $1 million to install about 2,600 LED light fixtures. The cost savings will allow Lansdale to put more money toward other infrastructure projects, such as road improvements and updates to meet requirements in the Americans With Disabilities Act, Krauss said. Borough officials plan to finish installing the lights by the fall. "The faster we get them in," he said, "the sooner we start saving the money."